Pour 1 cup of Maddie Rae's White Slime Glue into a bowl. Add 1 cup of water and red food coloring, then stir. Add 1 to 2 pinches of baking soda. Mix slowly until dissolved. Mix continuously until slime starts to form. Continue to add additional saline solution until you reach your desired consistency. 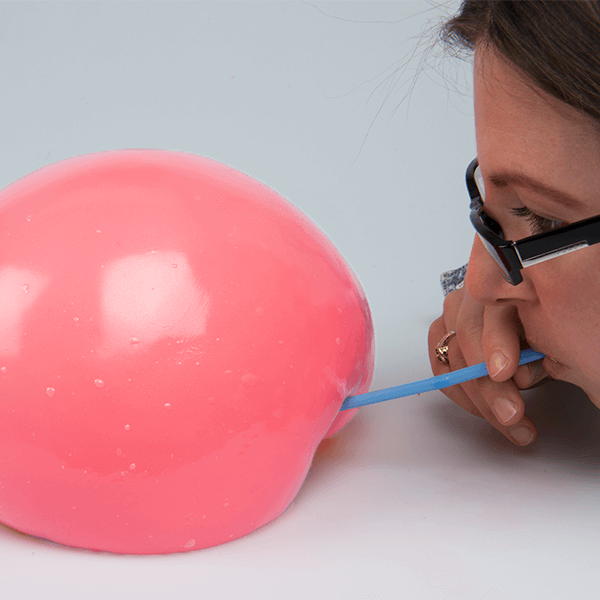 Poke the end of a plastic drinking straw into the slime and blow out air to make bubbles. What's the biggest bubble you can blow!? Store your slime in an air tight container when not playing with it. The more you knead and play with your slime, the firmer and less sticky it will become! Slime is a great activity for many ages! All recipes are meant for children out of the mouthing stage and close supervision is recommended. When making slime recipes with borax, be sure to use the borax under adult supervision or have an adult be in charge of that ingredient. Borax should never be eaten and should be kept out of the reach of small children. Once slime time is over, children are encouraged to wash their hands thoroughly.